TROY, NY--(Marketwired - December 14, 2015) - Paper Battery Company, developer of an innovative supercapacitor-based energy storage and battery enhancement technology, today announced the completion of UL certification for its PowerResponder® product line. PowerResponder is a line of new hybrid supercapacitors with technology enhancements that aim to replace traditional lithium ion batteries in select applications. PowerResponder has also been certified as RoHS compliant, giving it added environmental and safety benefits. The product line will be available in a range of sizes from 90F to 9000F with initial products available to OEM customers by the end of the year. "PowerResponder technical innovations, along with high reliability and safety features validated by an independent certified laboratory, make it ideal for consumer and industrial products. Its fast recharge capability enables devices to charge in minutes to be used for hours," said Shreefal Mehta, president and CEO of Paper Battery Company. "By rapidly recharging -- or energy-snacking™ as we like to call it -- customers can now carry just the amount of energy needed for their tasks, with high availability of their device due to the turbo-charging in seconds not hours. The long cycle life of PowerResponder makes it possible to integrate the cell as part of the product, with a life as long as, or longer than, the product it powers." The PowerResponder hybrid supercapacitor product line from Paper Battery Company leverages advances in technology and form factor to provide a new power source for today's devices, components and accessories. Compared to a typical lithium ion battery, PowerResponder provides 10X higher peak pulse power capacity, 100X greater cycle life, higher reliability in high temperature applications, lower energy density, holds charge with a similar low leakage current and is much safer with no risk of flammability or explosion with runaway heating. With these advantages, PowerResponder is not subject to the same air cargo concerns and shipping restrictions as lithium ion batteries and can replace lithium ion batteries where safety is a huge concern or where fast charge is valuable for high availability and reliability. The operating voltage range matches that of lithium ion batteries, making it an easy fit to existing electronics with minimal modifications. Compared with existing traditional symmetric supercapacitors (EDLCs), the PowerResponder has an industry-leading 5-7X higher energy density and much higher cell voltage, replacing EDLCs with a cheaper and more compact solution in high energy, high-reliability applications. The initial target markets for PowerResponder are high-reliability backup power applications, and in consumer and industrial products, replacing existing supercapacitors with cost and volume efficiency, and replacing lithium batteries with added safety benefits. The PowerResponder product line is in production now and will be available to OEM customers in the fourth quarter of 2015 in sizes of 90F to 9000F. Paper Battery Company has also released new demonstration videos and application notes on its website showcasing the fast charge functionality. Further product details are available directly through the company's application engineering and sales contacts, Gene Armstrong and Michael Leiber, at sales@paperbatteryco.com. The Paper Battery Company has two supercapacitor-based product lines with game-changing ultrathin form factors and industry-leading performance. Its high-energy supercapacitor product line, PowerResponder, can replace batteries or enable companies to use smaller batteries without compromising energy or peak performance. PowerWrapper® is an interstitially placed ultrathin power plane with stable voltage and clean pulse power at all points wherever pulse power is needed. Supercapacitors can replace batteries or enable companies to use smaller batteries without compromising energy or peak performance. Paper Battery Company's patented form factor solution allows for revolutionary size changes in wearables, accessories, and mobile electronics. The company's products provide scalable voltage, energy and power in a single, ultrathin package. The long life, environmentally friendly device works with existing lithium batteries, reducing waste, and fits in or around existing components. 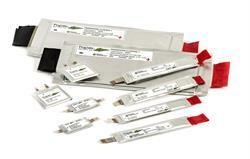 Production units from Paper Battery Company's PowerResponder product line. 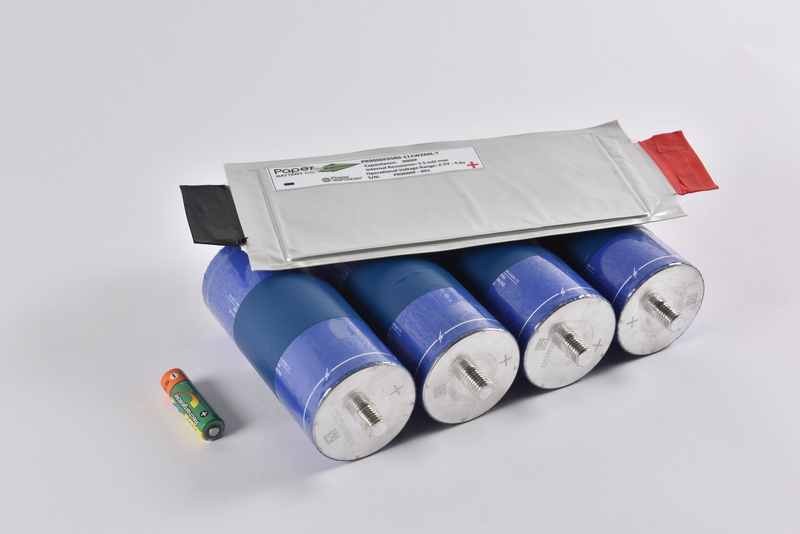 The Paper Battery Company PowerResponder Product Line is a new line of hybrid supercapacitors available in a range of sizes from 90F to 9000F. Paper Battery Company introduces game-changing ultra thing form factor and high voltage, enabling the replacement of four large, bulky supercapacitors with a single thin sheet-like cell as shown. A standard AA alkaline battery is also show for size comparison.